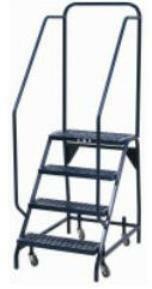 A Plus Warehouse sells various types of ladders. Learn more. 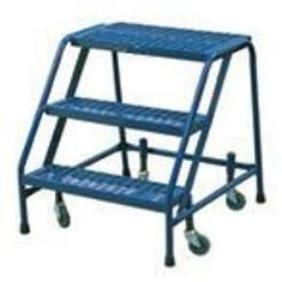 Next step ultra wide rolling ladders are a popular item. These ladders are probably the safest we offer. These industrial ladders have a 36 inch tread width. This type of width is unheard of for a majority of ladders. Many companies don’t even offer ladders that wide. At A Plus Warehouse however, the company fills the needs of every customer. Having a width this long makes the product extremely safe. It would be extremely difficult to miss a step with this product. It is as if the step is screaming, “ hey I am here.” The product also has a 50 degree slope. This also adds to the safety of this product. If a person trips on this ladder, then they are probably extremely clumsy. It is almost impossible to trip over this ladder. 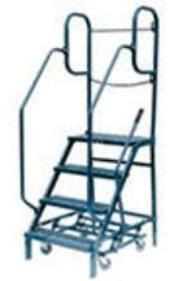 This ladder meets or exceeds all OSHA and ANSI requirements. At the top of this ladder lays a platform. This is why the item is typically used as a truck and dock access ladder. 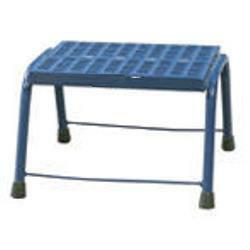 The platform measures 36 X 49 with an 800 pound capacity. Front and side have snap chains for easy access as well. A picture of the next step ultra wide truck ladder is shown to the right. 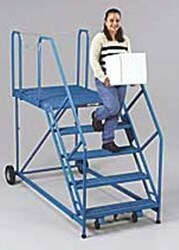 Although these ladders are typically sold more locally, the company can product CAL OSHA for a reasonable upcharge. Customers should order this item today they will not be displeased.